In an effort to counter attack Tata Nano, Maruti has launched its smallest and ultra cheapest car – Maruti Cervo in the Indian car market. The car is expected to be a five door hatchback model and would establish itself as a leader in the entry level segment. 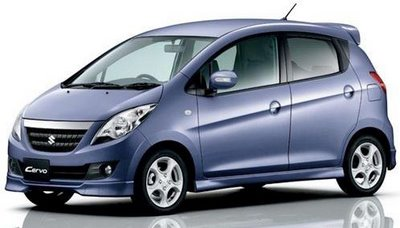 The car is expected to be launched in the Indian car market by January 2011. Maruti Cervo is expected to be available in seven vibrant colours namely – Superior White, Midnight Black, Silky Silver, Firebrick Red, Breeze Blue, Baker’s Chocolate and Blistering Grey. The front of the car is compact. The headlight cluster is in ‘eye shape’ and comprises of round turn indicator and headlamp. The honey comb radiator grille is very sleek. Front and rear bumpers, side view mirrors, door handle bars are body coloured. Small turn indicators are fitted at the front side of the car. The rear side of the car comprises of rear spoiler, rear wiper and beautiful LED brake light. The taillight cluster consists of brake lights and turn indicators. The car also consists of compact antenna at the rear roof. Maruti Cervo has a host of comfort features. The car is ultra spacious with sufficient legroom and headroom for the occupants. The car is expected to have good storage space also. The car comprises of a powerful A.C., power windows, remote central locking, remote boot and remote fuel filler. Other comfort features include manual driver seat adjustment, driver side manual door mirror, tinted glass and folding rear seats. The adjustable steering wheel is expected to be three spoked and powered which helps to handle the car with ease. The car would come with a wide dashboard comprising round AC vents at both ends and instrument panel just behind the steering wheel. The seats for the driver and passengers are wide and comfortable with small headrest. The car is fitted with many safety features. The car is expected to have anti-theft system, seat belts, child safety lock, passenger side rear view mirrors, front and side impact beams, engine immobilizer and two airbags. The sleek suspensions not only provide smooth drive but adequate safety also. The braking system is sharp and spontaneous. Maruti Cervo would be equipped with 0.7 L, 658 cc which generates a maximum power of 54 bhp at 6500 rpm and a maximum torque of 64 Nm at 3500 rpm. The engine uses Variable Valve Timing (VVT) technology which ensures lesser carbon emissions, greater fuel economy and refined mill efficiency. The car would come fitted with four speed automatic transmission. Maruti Cervo is expected to provide a mileage of around 21 kmpl on highway and 17 kmpl in city driving conditions. The car is speculated to cross 0-100 km/hr in around 25 seconds. The top speed of the car would be around 115 km/hr. The price of Maruti Cervo (taking New Delhi as base price location) is expected to be Rs.1,50,000. However, the price specified is indicative price only and reflects lowest approximate price which excludes tax, registration, insurance and cost of accessories. I eagerly awaiting for the maruti cervo car. Though no official statement has been made by Maruti officials but it is expected that Cervo will be here in coming days. It is expected that the Maruti Cervo will be priced in the range of Rs. The base model of the car is expected to have power steering and AC as standard.Interiors will be of good quality and attractive.